Vintage Porcelain/China Blue Willow Style Elephant Design Tea Pot, thought to be from Thailand, Circa 1960's, Manufacturer unknown. 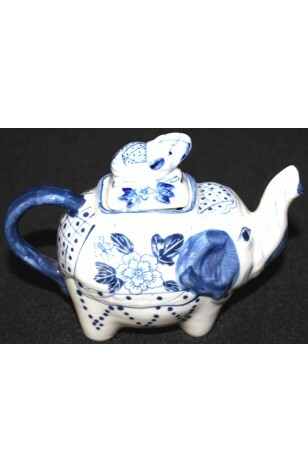 This is a Small Blue & White Tea Pot which consists of Two Elephants as the Design. The Larger Elephant is the Tea Pot, and the Smaller Elephant is the Lid. Both have their "Trunks" raised upward for "Good Luck". Believe it was made in Thailand based on research.. sometime in the 1960's to 1970. This is a lovely little Tea Pot that anyone would fall in love with.